Is there a better alternative to AutoKrypt? Is AutoKrypt really the best app in Security category? Will AutoKrypt work good on macOS 10.13.4? 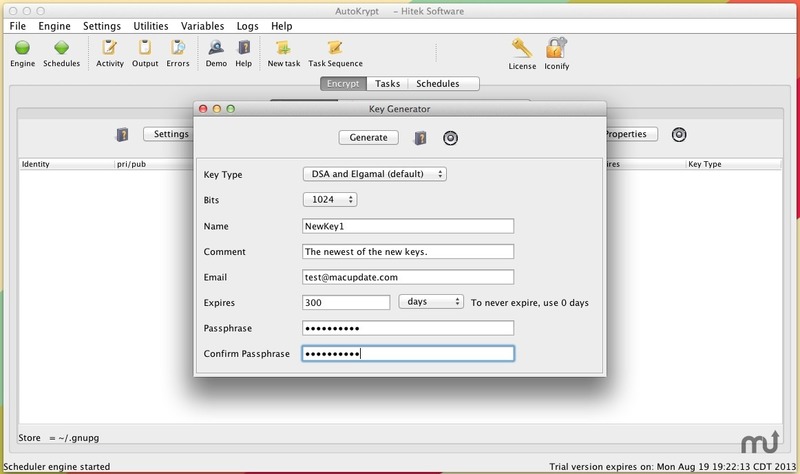 AutoKrypt is data-encryption software designed for automation. Automatically encrypt or decrypt files and folders on a schedule. Encryption methods include password-based, secret key, public key, and private key, OpenPGP password, and Open PGP public and private key. FTP commons browser bugfix introduced in 11.08. In some situations, output was only sent to output log. No output was seen in FTP commons browser when connection error occurs. AutoKrypt needs a review. Be the first to review this app and get the discussion started! AutoKrypt needs a rating. Be the first to rate this app and get the discussion started! Key generator can generate secret, public, private, OpenPGP public keys, and OpenPGP private keys. Bug fix: SFTPMonitor and SFTPMonitor-j 'Task to Run' field did not support and or | options to run multiple tasks simultaneously or in sequence. Copy task - Atomic move option added to Copy Files task. Move is done Atomically, so any process working on the folder will only see the full file, i.e. no partial file available if processed during Move. FtpCommand-j: functions MNDGET (Get multiple directories based on names only listing) and MNFGET (Get multiple Files based on names only listing) added. FtpCommand task: now supports Ftp profiles. Previously only supported host/port/user/password..
FtpCommand task: added ReplyCode variable for RFC 959 command responses. FTP (commons and jscape) libraries now support sending a Startup FTP command. Cleaned up various extra unnecessary debugging information into debug log. Default Engine port changed to prevent conflicts with Version 10 Engine ports. Automize 2002, AbleFtp 2003, JaSFtp 2004, AutoKrypt 2005, ZipKrypt 2009. Filenames100 variable added to FTP, FTP-J, SFTP, SFTP-J tasks. These are the first 100 Files transferred. Task Table sorting by date field caused fictitious error to be logged into debug log. Logging change. Task related logging for FTP/SFTP tasks is not duplicated into the output log. This improves performance and avoids redundant data. Shutdown Hook and memory log added when engine is exiting. This logs information when engine is requested to shutdown. Email Server Profiles bugix: Setting a non default port value resulted in incorrect port value shown when profile is reloaded. However, port value was correctly saved and used during connection. New Search Button added on Tasks list window. Allows users to search tasks and quickly launch task or schedule editors or view logs and variables. Useful for users with 100s of tasks. FTP commons - EPSV support added. FTP-J Jscape - EPSV and EPRT support added.